I am a second year PhD student advised by Laurent Vanbever in the Networked Systems Group at ETH Zürich. 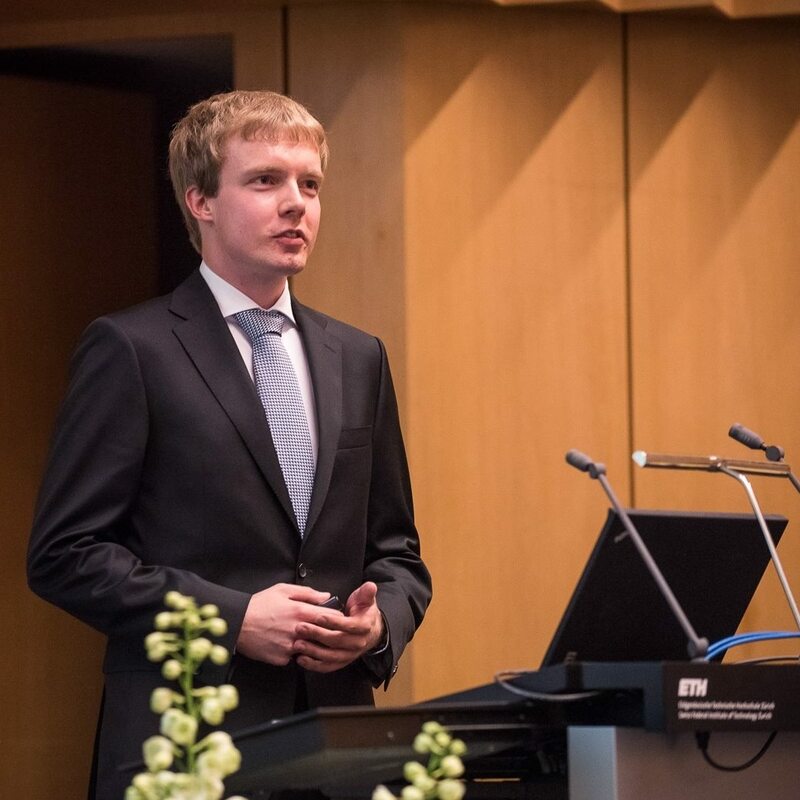 My research focuses on the security of computer networks. In particular, I work on solutions which leverage recent advances in network programmability to make networks able to detect and mitigate attacks and to provide more security and privacy. Part of my work is funded by armasuisse and the Zurich Information Security & Privacy Center (ZISC). I received both my master and my bachelor degree in electrical engineering and information technology from ETH Zürich. Two papers accepted at CyCon 2019. NetHide: Secure and Practical Network Topology Obfuscation accepted at Usenix Security 2018. 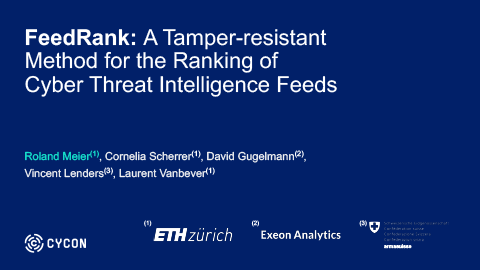 FeedRank: A Tamper-resistant Method for the Ranking of Cyber Threat Intelligence Feeds accepted at CyCon 2018. I'm looking forward to be part of the academic jury for the Wings of Excellence Award at the St. Gallen Symposium 2018. The new website of our group is online! I feel honored to be awarded with the NATO CCD COE Student Award 2017. My talk at CyCon 2017 is available here. The website about our iTAP-project is online: https://itap.ethz.ch. Check it out to learn how programmable switches can provide anonymous communication! I'm humbled to receive an ETH Medal for my Master thesis “SDN-based Network Obfuscation”. My talk at the Master ceremony is available here. NATO CCD COE CyCon 2019. Tallinn, Estonia (May 2019). USENIX Security 2018. Baltimore, MD, USA (August 2018). Simple path tracing tools such as traceroute allow malicious users to infer network topologies remotely and use that knowledge to craft advanced denial-of-service (DoS) attacks such as Link-Flooding Attacks (LFAs). Yet, despite the risk, most network operators still allow path tracing as it is an essential network debugging tool. In this paper, we present NetHide, a network topology obfuscation framework that mitigates LFAs while preserving the practicality of path tracing tools. The key idea behind NetHide is to formulate network obfuscation as a multi-objective optimization problem that allows for a flexible tradeoff between security (encoded as hard constraints) and usability (encoded as soft constraints). While solving this problem exactly is hard, we show that NetHide can obfuscate topologies at scale by only considering a subset of the candidate solutions and without reducing obfuscation quality. In practice, NetHide obfuscates the topology by intercepting and modifying path tracing probes directly in the data plane. We show that this process can be done at line-rate, in a stateless fashion, by leveraging the latest generation of programmable network devices. We fully implemented NetHide and evaluated it on realistic topologies. Our results show that NetHide is able to obfuscate large topologies (> 150 nodes) while preserving near-perfect debugging capabilities. In particular, we show that operators can still precisely trace back >90% of link failures despite obfuscation. NATO CCD COE CyCon 2018. Tallinn, EE (May 2018). Organizations increasingly rely on cyber threat intelligence feeds to protect their infrastructure from attacks. These feeds typically list IP addresses or domains associated with malicious activities such as spreading malware or participating in a botnet. Today, there is a rich ecosystem of commercial and free cyber threat intelligence feeds, making it difficult, yet essential, for network defenders to quantify the quality and to select the optimal set of feeds to follow. Selecting too many or low-quality feeds results in many false alerts, while considering too few feeds increases the risk of missing relevant threats. Naïve individual metrics like size and update rate give a somewhat good overview about a feed, but they do not allow conclusions about its quality and they can easily be manipulated by feed providers. 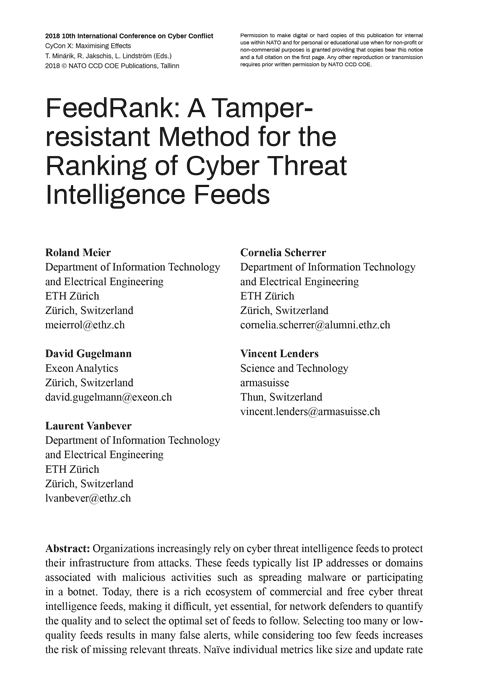 In this paper, we present FeedRank, a novel ranking approach for cyber threat intelligence feeds. In contrast to individual metrics, FeedRank is robust against tampering attempts by feed providers. FeedRank’s key insight is to rank feeds according to the originality of their content and the reuse of entries by other feeds. Such correlations between feeds are modelled in a graph, which allows FeedRank to find temporal and spatial correlations without requiring any ground truth or an operator’s feedback. We illustrate FeedRank’s usefulness with two characteristic examples: (i) selecting the best feeds that together contain as many distinct entries as possible; and (ii) selecting the best feeds that list new entries before they appear on other feeds. We evaluate FeedRank based on a large set of real feeds. The evaluation shows that FeedRank identifies dishonest feeds as outliers and that dishonest feeds do not achieve a better FeedRank score than the top-rated real feeds. ACM SOSR 2017. Santa Clara, CA, USA (April 2017). Advances in layer 2 networking technologies have fostered the deployment of large, geographically distributed LANs. Due to their large diameter, such LANs provide many vantage points for wiretapping. As an example, Google's internal network was reportedly tapped by governmental agencies, forcing the Web giant to encrypt its internal traffic. While using encryption certainly helps, eavesdroppers can still access traffic metadata which often reveals sensitive information, such as who communicates with whom and which are the critical hubs in the infrastructure. 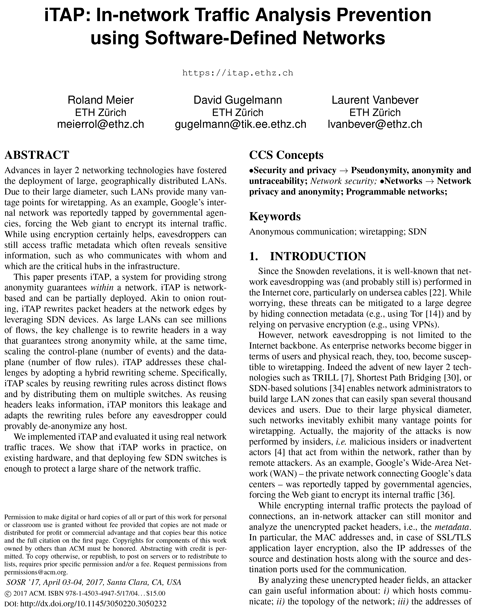 This paper presents iTAP, a system for providing strong anonymity guarantees within a network. iTAP is network-based and can be partially deployed. Akin to onion routing, iTAP rewrites packet headers at the network edges by leveraging SDN devices. As large LANs can see millions of flows, the key challenge is to rewrite headers in a way that guarantees strong anonymity while, at the same time, scaling the control-plane (number of events) and the data-plane (number of flow rules). iTAP addresses these challenges by adopting a hybrid rewriting scheme. Specifically, iTAP scales by reusing rewriting rules across distinct flows and by distributing them on multiple switches. As reusing headers leaks information, iTAP monitors this leakage and adapts the rewriting rules before any eavesdropper could provably de-anonymize any host. We implemented iTAP and evaluated it using real network traffic traces. 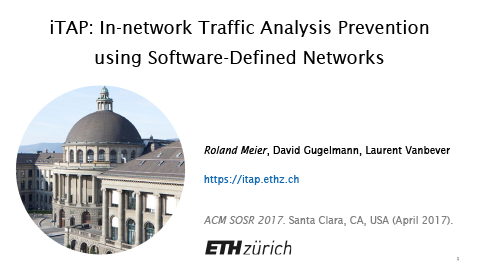 We show that iTAP works in practice, on existing hardware, and that deploying few SDN switches is enough to protect a large share of the network traffic. NATO CCD COE CyCon 2018, Tallinn, EE (May 2018). NATO CCD COE CyCon 2017, Tallinn, EE (June 2017). D-ITET Master Ceremony, ETH Zürich (June 2016).